I’m sure we all remember the great PlayStation Network outage of 2011. For 23 days PSN was inaccessible and costumer’s private information was stolen from Sony. For me personally, I had no sensitive information on PSN, and the entire ordeal became a blessing in disguise. The top men at Sony formally apologized for dropping the ball, and that apology came with the offer of free games for PSN users. We were all offered five games and we could pick two. The only one that really piqued my interest was InFamous. Despite having the choice to pick another game, I never did. I had heard good things and decided that this is as good of an opportunity as any to finally play it. I enjoyed it quite a bit, but felt like it could use some work. InFamous 2 was about to be released and I was confident that, given what I saw in the first game, the sequel would be superior. Fast forward to 2012 and I was vacationing in Florida. Every time I visited the United States in the past, it was always my opportunity to pick up console games on the cheap. I still remember my first time. I walked into an EB Games with $20 and came out with Final Fantasy X, Onimusha: Warlords, and Twisted Metal: Black. I thought that these Americans were completely insane. This time I went searching for titles on my list at a Gamestop. I found a used copy of InFamous 2 on the cheap. In hindsight I probably shouldn’t have bought this particular used copy. I should have taken the lack of a game box as a sign. Regardless, I bought it, since I enjoyed the first one and it was cheap. Fast forward to 2016 and my then girlfriend had just moved into a new apartment in another city. I almost always play games on my PC at my place, and since the PS3 had other uses, I hauled it over to her place. I also brought along a few games I might be able to play when I’m there. She was not a gamer at all, and had no idea that video games was such a big industry. I got her to play Journey though; she really liked it. One day she had to study for an exam, so I decided to pop in InFamous 2. InFamous was a game that made me say: “I shouldn’t have waited so long to play this game.” Because I thought it was fantastic. I loved to just traverse through the city, lob light grenades, and toss cars around. *Spoiler* When that weird giant monster shows up out of nowhere, I just kept throwing cars at it. It was a hell of a moment. It truly made me feel like I was a DC or Marvel superhero. I was fighting a giant monster and causing untold amounts of property damage in the process. The story isn’t half bad either. The final choice/twist at the end is something I should have expected, thinking back on the characters. It’s just a shame that the disc was damaged. Near the end of the game I was watching the cutscenes in super-slomo. It took me 45 minutes to get through a 2 minutes cutscene. I’ll probably wrangle together enough money to buy a PS4 by the time the PS5 comes out. 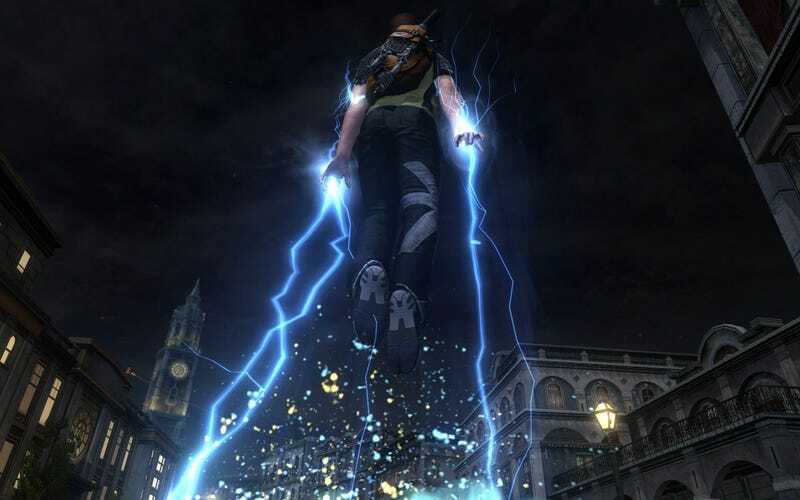 When that time comes, I might look into InFamous: Second Sun. I’m kind of curious as to how they managed to make a new story, given how the second one ended. Well, the “good” ending at least. Now that I’m writing this, I realize that I never even looked into how the evil side ended.